State lawmakers leave Southwest Key, the Tucson facility that holds immigrant children separated from their families, after a tour on Friday, July 17. 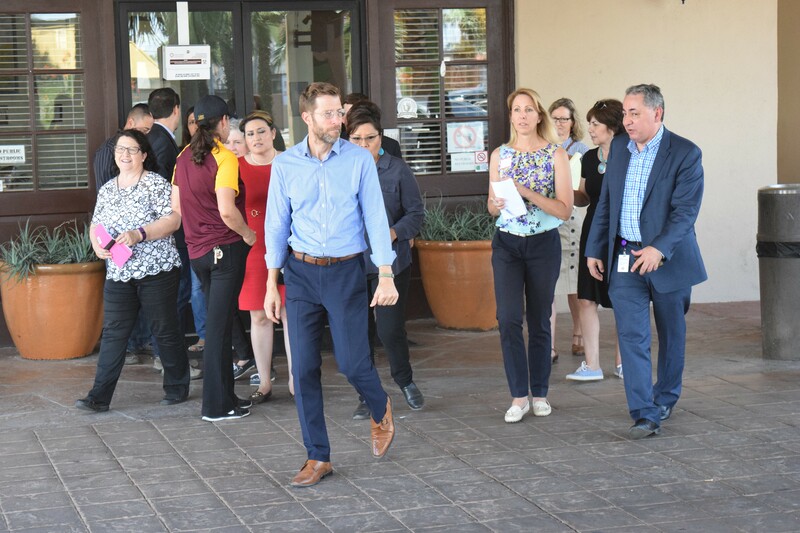 Sixteen state lawmakers toured the Tucson center holding immigrant children, Southwest Key, on July 13—three days after the federal government’s deadline to reconnect children under 5 years of age with their parents. The facility currently holds 294 children, between the ages of 5 and 17, of which 73 were separated from their families at the border since the announcement of Donald Trump’s zero-tolerance policy. Two weeks ago, the facility had 84 children who had been separated from their families, of which 11 were presumably either reunited with their families or deported. The facility’s staff wouldn’t specify where the children had gone. Rep. Kelli Butler (D-Phoenix) said she pushed the staff on where the children had gone, and staff said they couldn’t say. “I left feeling very concerned, more than ever,” she said. She asked them for details on how they were going to comply with the deadline to reunify children, and staff wouldn’t give any details. Southwest Key staff told the lawmakers they’re on track to comply with the second federal deadline, on July 26, to reunite the separated children. U.S. Department of Health and Human Services Regional Director Brian Shiozawa, who was also at the facility, said they hope to meet the deadline. “HHS would love to see the children reunited safely with their families,” he said. In mid-June the Department of Homeland Security announced 2,342 children had been separated from their parents at the border since early May. On July 12, the federal government announced it had reunited 57 out of 103 children under 5 years old who had been separated from their parents as a result of the zero-tolerance policy. The other 47 children were not reunited for reasons including their parents had been deported, have criminal records, have a communicable disease or were found not to be the biological parents. After a 45-minute Q&A with the Southwest Key staff, the lawmakers were asked to put their phones in their cars before being given a tour of the facility. Powers said children silently walked by in a single-file line. The lawmakers saw a few groups adding up to about 30 kids filing from one room to another, as wells as one classroom of 25 kids. Powers said the staff wouldn’t comment on the legal status of the children at the facility, whether they were refugees, asylum seekers or undocumented without seeking asylum. Staff told the lawmakers not to interact with the children. When Shiozawa, the HHS regional director, told staff to go ahead and let the lawmakers talk to the children, the staff insisted that they couldn’t, per the Office of Refugee Resettlement, a branch of HHS and the federal organization in charge of the children. Shiozawa said it was his first visit to the facility, and he hadn’t realized that ORR had decided not to let visitors interact with the kids. His current understanding is that it’s ORR policy. Powers said the facility looks like a cross between an elementary school and old hotel. It was once a Hilton hotel that housed Hollywood movie stars before it became university student housing. It began housing unaccompanied minors in 2014. The hotel rooms have images including Disney princesses on the walls next to bunk and single beds. The courtyard is dirt. The lawmakers saw a basketball court but no playground. A week earlier, state senator and candidate for U.S. Congress Catherine Miranda (D-Phoenix) visited the facility and passed around her phone so the children could call their parents. “As a mother, I truly just sat there and thought: I do not want them to see me as an elected official but a sister and a mother,” she said. She talked with them, hugged them, gave one of them the gold crucifix she was wearing around her neck, and she promised them to do what she could to help them. She was surprised and disappointed that she couldn’t interact with them on the second visit, a week later. “One week, there are no rules and I’m allowed to be a humanitarian, and the next week, my phone is taken away, and I’m not allowed to talk to the kids,” she said. Miranda said her purpose in being there is not to make sure the facilities are clean or that the kids are fed. She said that’s a distraction from the real issue of making sure the family reunification happens. There have been many reports regarding the account of former employee Antar Davidson, who said he quit his job at Southwest Key after being told to separate young siblings who were hugging after being separated from their parents. Powers says the facility director Juan Concepcion Carrero told the group of lawmakers that they don’t stop children from hugging. When a Tucson Weekly reporter called Southwest Key, the automated machine took her in circles, never leading to a human being. And the repeated times she called Concepcion Carrero’s desk, he never picked up and his voicemail was full. “It’s not a fancy resort, but they get meals, clothes, education, medical care and legal representation,” he said. When questioned about the legal representation, he said he wasn’t positive from where or if they did receive legal representation. Powers said when lawmakers asked the staff about legal representation for the children, they sidestepped the question. The government does not provide public defenders for immigrants. The Florence Project is a local nonprofit legal service organization that provides representation for immigrants facing legal proceedings, and is primarily funded through donations. “It doesn’t seem like the federal government feels it has any obligation to these kids, and that’s disturbing to me,” said Rep. Kirsten Engel, D-Tucson. She later added that the state has a responsibility to the children and should make sure they have legal representation and the Florence Project has enough resources. During the Q&A, Southwest Key staff told lawmakers that teachers are not certified but have bachelor’s degrees. However, none of the teachers are certified in teaching to English Language Learners, students who speak other languages before English. There are case managers and medical staff on site. Children meet weekly with one of the facility’s 21 behavioral counselors, most of whom have master’s degrees but are not certified.